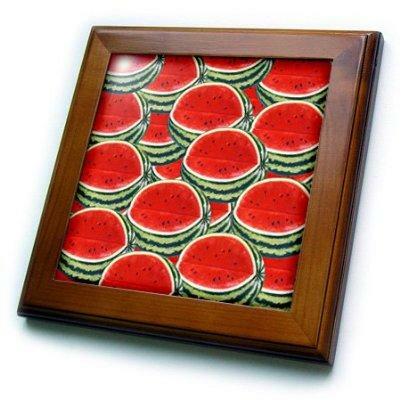 FEATURED PRODUCT AND MAY PRIZE: THE WATERMELON FRAMED TILE - What About Watermelon? They say you should always have at least one red object in every room to add a little color to things, and this 8-by-8 inch tile will do the trick. It comes all ready to be hung on the wall, but I guess you could also use it as a trivet. For any guys reading this, a trivet is also known as “that thing you put hot pots and pans on.” Using this is probably a lot better than using a magazine or a book… or nothing at all. JULY PRIZE: WATERMELON FOR YOUR FEET! This would look great in my black and white kitchen. Just in time for summer! I remember my mother always saying something about having one red thing in every room just as an accent (she also reminded me that pizza boxes don’t count). This framed tile definitely counts. This would match a watermelon bowl and salt and pepper shaker set I have. Not to mention that I used that photo as a screeen saver a few years ago!